Classical Opera continues its series of Mozart Operas on Signum Classics. 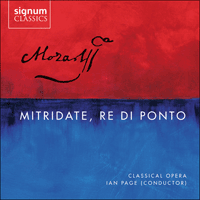 Mozart’s Mitridate, re di Ponto was first performed in Milan in 1770—the composer was still a month short of his fifteenth birthday and the opera ran for an impressive 22 performances. As well as the complete opera, this new release includes original versions of a number of arias that Mozart subsequently changed.